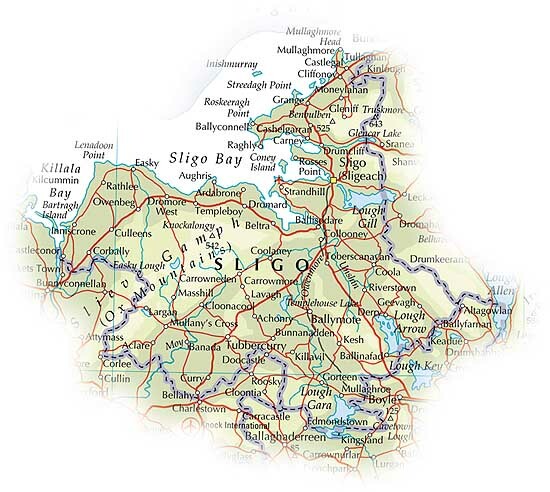 County Sligo (/ˈslaɪɡoʊ/ SLY-goh, Irish: Contae Shligigh) is a county in Ireland. It is located in the Border Region and is part of the province of Connacht. Sligo is the administrative capital and largest town in the county. Sligo County Council is the local authority for the county. The population of the county is 65,535 according to the 2016 census, making it the 3rd most populated county in the province. It is noted for Benbulben Mountain, one of Ireland’s most distinctive natural landmarks. The county was officially formed in 1585 by the Lord Deputy Henry Sidney, but did not come into effect until the chaos of the Nine Years' War ended, in 1603. Its boundaries reflect the Ó Conchobhair Sligigh confederation of Lower Connacht (Irish: Íochtar Connacht) as it was at the time of the Elizabethan conquest. This confederation consisted of the tuatha, or territories, of Cairbre Drumcliabh, Tír Fhíacrach Múaidhe, Tír Ollíol, Luíghne, Corann and Cúl ó bhFionn. Under the system of surrender and regrant each tuath was subsequently made into an English barony: Carbury, Tireragh, Leyny, Tirerril, Corran and Coolavin. The capital of the newly shired county was placed at Sligo. A causewayed enclosure discovered in 2003 at Maugheraboy is one of the earliest indications of Neolithic farming activity on the Cúil Irra peninsula. The nearbly megalithic cemetery of Carrowmore forms part of a huge complex of Stone Age remains connecting Carrowkeel in south Sligo to the Ox Mountains, to the Cuil Irra Peninsula, where the passage tomb named after the legendary Queen Maeve, Miosgán Médhbh, dominates the western skyline from the crest of Knocknarea Mountain. The Caves of Kesh, famous in Irish mythology, are in south County Sligo. A recent decoding  of the work of Marinus of Tyre and Ptolemy shows Sligo as he likely location of Nagnata, an important place of assembly in the Iron Age. Famous medieval manuscripts written in the area include the Book of Ballymote, written in the territory of Corran, the Great Book of Lecan, and the Yellow Book of Lecan, both written in Tir Fhiacrach. The patron of the Annals of the Four Masters was Fearghal Ó Gadhra of Coolavin in south County Sligo. Sligo County Council is the governing body for the county. It is divided into five Local Electoral Areas (LEAs) Ballymote, Dromore, Sligo-Drumcliff, Sligo-Strandhill and Tubbercurry. There are 25 members elected to Sligo County Council. Sligo is part of the Sligo-Leitrim constituency and has four representatives (TD's) in Dáil Éireann, Tony McLoughlin (FG), Marc MacSharry (FF) Martin Kenny (SF) and Eamon Scanlon (FF). This crest was adopted by Sligo County Council in 1980. The design on the black shield, which shows an open book on which there is a Celtic Cross and a red rose, represents collectively the literary and cultural history of Sligo. These refer to such early works as the Books of Ballymote and Lecan, while the rose was a significant theme in the poetry of W.B.Yeats. The escallop shells sprinkled on the shield refer to the origin of the word Sligeach -- "a place abounding in shells". The boar's head refers to the "wild boar of Benbulben" in the Diarmuid and Gráinne myth. The colour scheme of the crest incorporates the Sligo GAA colours of black and white. County Sligo has a long history of traditional music. The south of the county is particularly noted with such musical luminaries as James Morrison, Michael Coleman, Paddy Killoran, Fred Finn, Peter Horan, Joe O'Dowd, Jim Donoghue, Martin Wynne, Oisín Mac Diarmada (of Téada), tin-whistle player Carmel Gunning and the band Dervish. The county has many traditional music festivals and one of the most well known is the Queen Maeve International Summer School, a traditional Irish Music summer school of music and dance which is held annually in August in Sligo Town. On the more contemporary music scene there are Westlife, Tabby Callaghan and The Conway Sisters who are from Sligo. Strandhill, about 9 km west of Sligo, hosts the Strandhill Guitar Festival each year, featuring a wide variety of guitar music and musicians. Unlike its neighbouring counties, Sligo has had more success at soccer rather than Gaelic games. The county is home to League of Ireland Premier Division club Sligo Rovers, who have played home matches at The Showgrounds since they were founded in 1928. Brother Walfrid, the founder of Celtic Football Club, was born in Ballymote. Sligo is the 22nd largest of Ireland's 32 counties in area and 26th largest in terms of population. It is the fourth largest of Connacht's 5 counties in size and third largest in terms of population. The County borders County Mayo to the west, County Roscommon to the south and south-east and County Leitrim to the north-east. See also: Category:People from County Sligo. Feldmarschall The 3rd Earl of Carlingford (1639-1704) - a very senior-ranking military commander for the Hapsburg Monarchy in the Holy Roman Empire (or the Austrian Empire). Lord Carlingford was born in Ballymote and served for many years as the chief minister of the Duchy of Lorraine. Feldmarschall Nicholas Graf von Taaffe and 6th Viscount Taaffe (1685-1769) - very senior-ranking military commander for the Hapsburg Empire. Born in Ballymote, the Graf was a cousin of The 3rd Earl of Carlingford. Owen Connellan - Irish Scholar, translated the Annals of the Four Masters in 1846. Served by the Sligo Line connecting Sligo to Dublin Connolly railway station. ^ a b c "Census 2016 Sapmap Area: County Sligo". Central Statistics Office (Ireland). Retrieved 11 April 2018. ^ "History Around You". www.resources.teachnet.ie. Archived from the original on 29 July 2014. Retrieved 28 July 2014. ^ "Sligo Arts". www.sligoarts.ie/FestivalsandEvents/Name,13321,en.html/ Sligo Arts. Wikimedia Commons has media related to County Sligo. Wikivoyage has a travel guide for County Sligo. "Sligo. A maritime county of the Province of Connaught, Ireland" . New International Encyclopedia. 1905. "Sligo, a county of Ireland" . Encyclopædia Britannica (11th ed.). 1911. "Sligo" . Collier's New Encyclopedia. 1921.